” Love that blog! 🙂 AC/DC are one of the best bands to work for too. Bev Wills (@CoreCritical), Miami, USA and Leeds, UK, November 21, 2013. 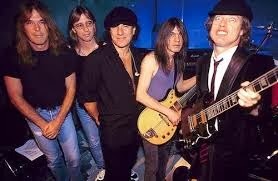 AC/DC: Cliff left, Angus right. in Australia. The following August I was in Melbourne and Lou Reed was in town. recently stormed the world’s charts. last ever performances for AC/DC. And, believe it or not, not so long after Bonn Scott joined AC/DC, I was standing next to four skinny little guys having beers at the bar in The Royal Standard pub in North Melbourne, one of whom was covered in tatts. This was Bon Scott, of course, whose memory is now honoured with a statue in Freemantle, West Australia, where he grew up. People are also currently raising money for a statue of the late lead singer to stand in the town square in Kirriemuir in Scotland, where Bon was born. with Acca Dacca, as the band’s known in Australia. I must have taken rock journalists to see Home over a hundred times.